I have fine, silky hair with dry ends. Dove shampoo rarely suits me as my scalp is oily and it makes my hair limp the next day. Recently I came across a new brand Prem Henna that sells various hair products including hair color products. 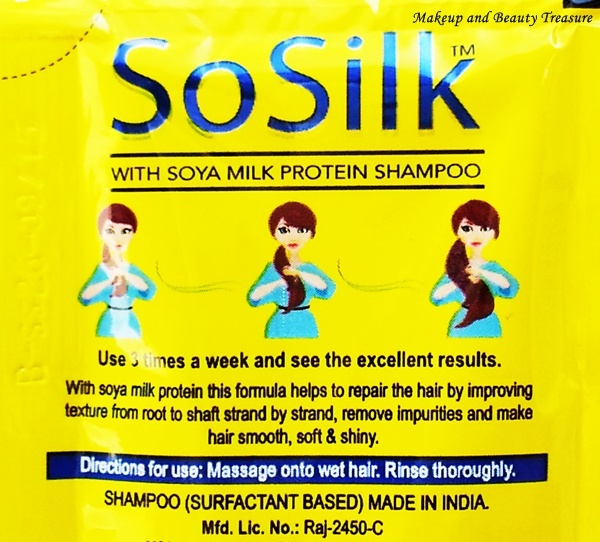 As I do not color my hair, I chose to try So Silk Shampoo* that is enriched with soya milk protein. These are available only in sachets and each is priced at Re 1. You can buy online HERE. So Silk Shampoo comes in yellow sachet with all the information written at the back. Make sure you cut open the sachet before, as opening it in shower is very difficult. I literally wasted half an hour opening the sachet with wet hands #lol. The shampoo is pearly white in color with good consistency. It looks just like Tresemme Shampoos I had used. The smell is mild and pleasant. It would not bother even sensitive noses. If you are a regular reader of my blog, you would know I never use my shampoos directly on my hair. I dilute it and then pour it on my hair. The shampoo lathers well but the lather disappears pretty fast. Lathering gives me the feeling of proper cleansing so it kind of disappointed me. I used it without conditioner in the first use just to see the results of the shampoo alone. It cleanses off my hair and oily scalp well without leaving any residue behind. As I have dry ends, I feel conditioner is a must have for me. My mom has normal hair and she does not feel the need to use a conditioner after using this shampoo. I have fine, weak and brittle hair and I have not seen any major improvement in my hair using this shampoo. May be I need to use it for at least 2 months to get strong hair! As the weather got chilled, I am glad that it does not dry my scalp or causes dandruff. • Comes in travel friendly sachets. • The shampoo smells wonderful! • Does not cause my scalp to itch. • Does not cause dandruff. • Cleanses the hair well. • Makes my dry ends knotty. Using conditioner with this shampoo is a must! • Does not add shine to my hair which I do expect from my shampoos. • No list of ingredients! So Silk Shampoo is a good shampoo if you have oily or normal hair. It cleanses hair effectively without leaving greasy residue behind. I have dry, weak hair and have not noticed any visible difference to my hair. May be I need to use it for regularly for few months to see the results! There are also many hair color products from the brand so if you color your hair you could check out their website! • Follow the shampoo with a good conditioner. 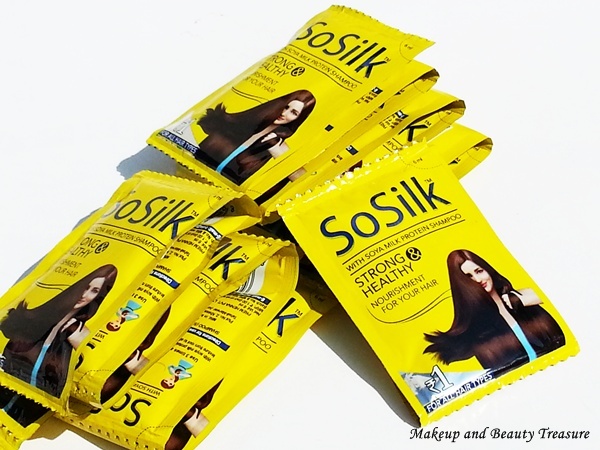 Have you tried So Silk Shampoo? What is your favorite shampoo?